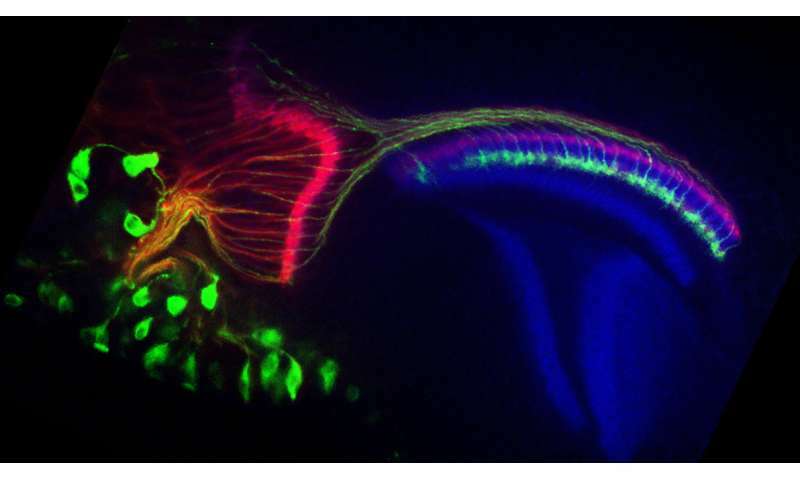 Scientists at Tokyo Tech have made an important discovery concerning the development of layer-specific axonal connections in the developing visual system of Drosophila flies. This discovery provides valuable insights into how neurons in the developing brain are wired. The molecular mechanisms we found can serve as a universal principle for wiring axons also in higher animals. We assume our findings help stabilize the regenerating axons to the desired depth in the brain layers, in the case such as neuronal transplantation after injury. 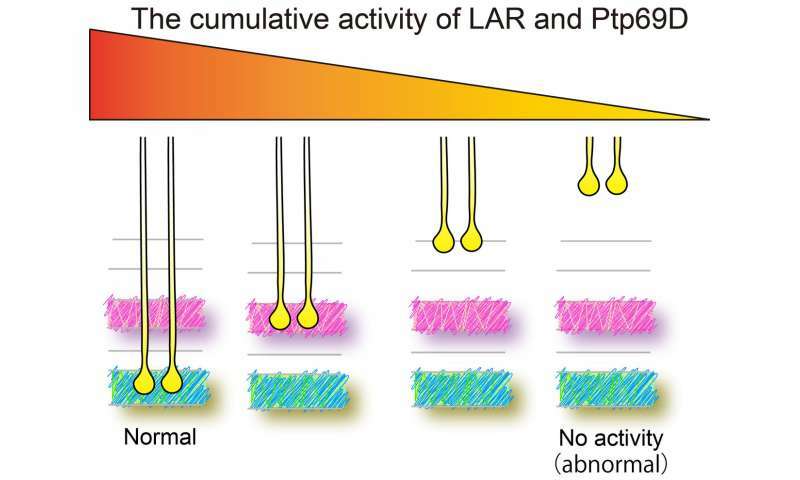 To identify how these stable connections form, Takashi Suzuki's group investigated the roles of two proteins, called LAR and Ptp69D, that are necessary for a group of light-sensitive cells called R7 photoreceptors to correctly project axons to the sixth layer (M6) of a visual area called the medulla in Drosophila brains. Their work is published in eLife. The group first created double-mutant embryonic flies in which the R7 photoreceptors did not express the LAR and Ptp69D genes. In these flies, over 80% of R7 axons failed to terminate within the M6 layer. The axons would initially reach the M6 layer, but as development progressed, they frequently retracted and exited the medulla entirely. They continued their research by selectively reintroducing LAR or Ptp69D in the double-mutant flies. Reintroducing either protein restored R7 axon termination in the medulla, but this rescue effect was inhibited when the scientists used mutations to delete parts of the restored proteins that affect functions within the neurons. This suggests that intracellular signaling from LAR and Ptp69D plays a key role in forming stable connections in the medulla. Interestingly, restoring LAR resulted in R7 axons mainly terminating in layers M0 and M6, whereas restoring Ptp69D resulted in R7 axons terminating in layer M3. Proteins like LAR and Ptp69D bind to target molecules called ligands, and this observation suggests that layers M0 and M6 contain ligands for LAR and that layer M3 contains ligands for Ptp69D. 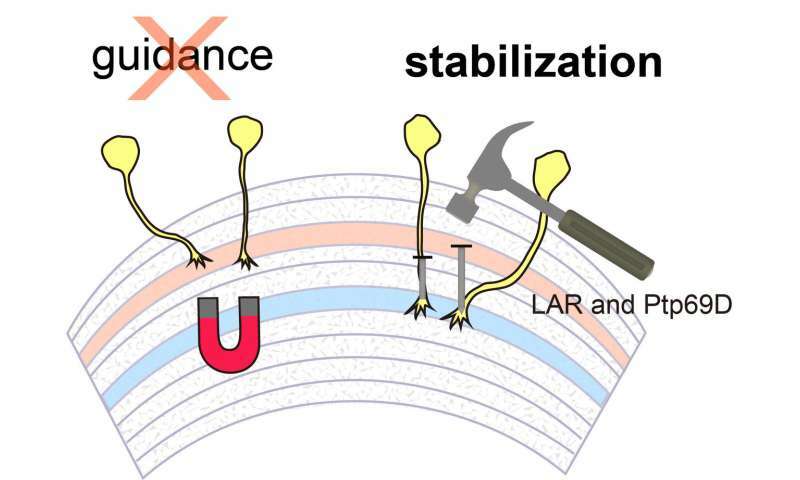 The presence of appropriate ligands would cause LAR and Ptp69D to form stable connections for the R7 axons. Taken together, these results provide important insights into how axon projections are targeted in the developing visual system. The effects of LAR and Ptp69D were both additive, in that cumulative expression determined the accuracy of axon targeting to the medulla, and protein-specific, in that LAR and Ptp69D tended to guide the axons to different layers in the medulla. A major task for future studies will be to identify the LAR and Ptp69D ligands that are hypothesized to mediate this layer-specific targeting.